These words are in the Grange Installation Ceremony. September is a new beginning with new officers being installed to their stations. The charges give those instructions as to the duties of their office. We should all witness an installation to renew our commitment to the Order. I welcome new officers and wish them success and remind everyone that together we move forward ... working against one another we stall or move in reverse. I attended the Northeast Lecturer’s Conference in Standish, Maine, with nice weather most of the time on Sebago Lake. This year's conference celebrated 100 years of Lecturers meeting to exchange ideas and programs to help educate and entertain Grangers. This was my third conference and I find it challenges everyone to get involved with new ways to make our lecturers programs less dull and more fun. Every Grange should allow their Lecturers time to present their program during a Grange meeting. It is one of our duties to education and make fun, with song or skit for our members. A good program can attract new members where a dull or same old program may cause members to lose interest. Our State Lecturer provides materials for all Lecturers and programs allow neighbors to exchange programs, check them out. Remember the New England Grange Building Sales Room at the Big E is coming up with jams, relishes, handmade sewing items and a quilt to be raffled off. Grange Sunday is September 27. Members planning to participate in the parade should be on the grounds by 3 P.M. Hope to see you there! 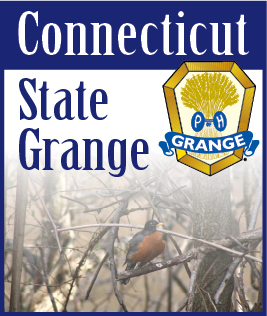 The 131st Session of the Connecticut State Grange is just around the corner, we hope that resolutions will be coming forth, so we have work to do during the sessions. We hope to have many members taking the Sixth Degree. All announcements will be in the Granger so watch for them and reply quickly. Our National Representative will be James Tetrault, National Lecturer, Jim is from New Hampshire and will bring great excitement and energy to our sessions. Please give him a warm Connecticut welcome during his stay with us. Our Membership Committee is making arrangements for National Membership Director Michael Martin, to present a program on Mentoring in the Grange, this will be in October. Keep an eye out for it and mark your calendars. National Session will soon be here. This year's host will be Lincoln, Nebraska. Election of Officers will be held this year and it will be my first time seeing a full election at National Grange. I think it will be exciting to see how different they do elections. Camp Berger is Celebrating its 60th anniversary this October, and the Kimberly’s are planning to host a Celebration during that month so please come and support the camp and see the improvements that have been made. Many Community Granges are having their Fairs please take the time a visit them to let them know that we support them and have something to eat there for we all know that Grange food is the best, or a close 2nd to Mother’s. As schools begin we begin to prepare for the Harvest, with all working together the work goes fast, and fun can be found in the tedious task, you just have to look for it and persevere.